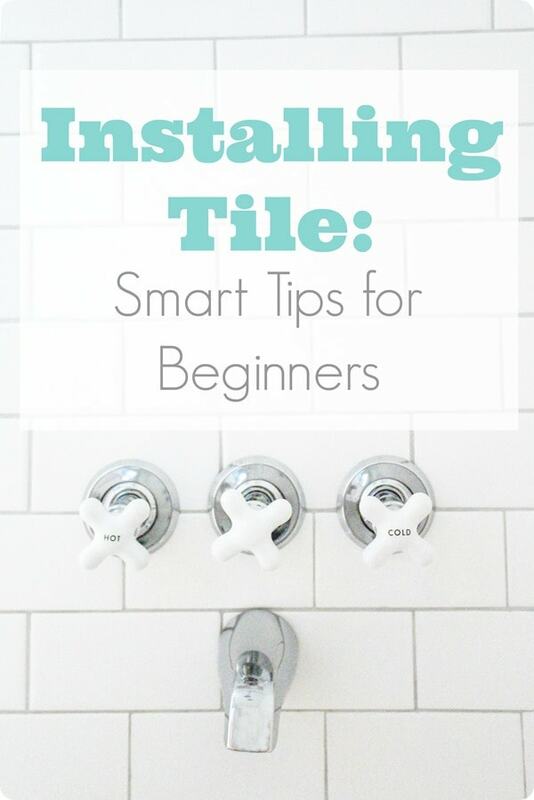 Installing Tile: Smart Tips for Beginners - Lovely Etc. Installing tile is one of those things that even avid DIYers are often a little afraid of. (Including me!) And after completing my first tile job, I can certainly see why; tiling is no joke! It is, however, 100% possible to do it yourself. Which leaves a few questions – should it be a DIY job or should you just pay a pro? And if you are going to do it yourself, what do you need to know to make sure the whole thing goes smoothly? This post contains affiliate links – thanks for supporting Lovely Etc. See my full disclosure here. Should I install my own tile or hire a professional? This is a huge question and the answer comes down to three things: money, time, and quality. Money is obviously a huge factor. Tiling is expensive. On average, having a shower surround like ours tiled professionally can cost anywhere from $800 to $5000. Of course the costs depend on a lot of factors including what type of tiles you choose and where you live. If money is tight, you can save a lot by doing it yourself. 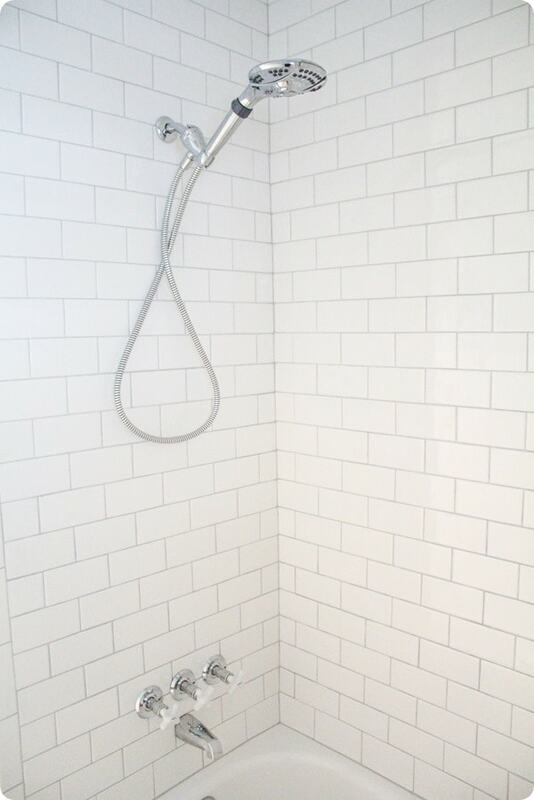 For our own project, I used classic white subway tile, one of the more inexpensive tiles around. And because I did all of the labor myself, the entire project cost only a couple hundred dollars which covered the tile, adhesive, grout, caulk, and basic tile cutting tools. But then, on the other hand, there is the time issue. Installing tile takes a long time. I’m talking eons. Seriously. It took me a month to tile our little shower because I was only able to work on it on my husband’s days off. (Tile and toddlers don’t mix. Trust me.) But even if I had been working on tile eight hours a day, it would have taken several days to finish the job. Tiling isn’t necessarily difficult, but it is very time-consuming. I’m sure it gets much faster with experience, but for a newbie, it’s a big job. So if you don’t have a lot of time to work on it or if you are on a tight deadline for your renovation, you may need to consider hiring a pro. So there you have it. Do you need to save money but have some time to spare? Do it yourself. Would you rather just pay someone else than risk screwing it up? Hire it out. Does spending hours laying tiles in straight lines make you want to bang your head on the nearest wall? Pay someone to deal with it. If you decide to go the DIY route, I’ve got some tips that will help make the job go much more smoothly for you. I’m not going to attempt to do a full tutorial. If you are looking for the full play by play, there are many awesome tutorials out there by people who have way more experience with tile than I do. I do, however, have a few things that may save you some headaches if you are new to this. The kind of thing that seasoned pros don’t really have to worry about or think about and forget to mention. I am in love with our new shower handles! As I was tiling, my husband made a comment that any mistakes I made would just be covered up by the grout. Wrong! In reality, grout does not hide mistakes, it just draws attention to them. So be very careful as you are laying your tile – small mistakes or sloppy tile lines will be even more apparent once the job is finished. Along those same lines, choose your grout color carefully. I chose to use a light gray grout with my white subway tile because I like the way it looks, but it also has another advantage. Using a grout that it is close in color to the tile helps hide any small imperfections in your tile job. If you choose a dark gray or black grout with white tiles, the high contrast will highlight every tiny mistake. The most important tool I used in the whole tiling process was a simple level. It keeps every line straight and even, which will make your final tile job look amazing. The level is essential right from the start. It seems like you should just be able to start tiling along the top of the tub or floor line, but a lot of times, the tub or shower floor isn’t exactly level. I found that our bathtub wasn’t level, so I used the level to mark my first tile line and worked from there. I also used the level to make sure that the tiles lined up vertically. I did our entire tile job without using a wet saw/tile saw. I am pretty sure it would have been much faster if I had used one, but I don’t own one and renting was out of the question in my situation. (See above, re: it took me a month to do this job. I couldn’t exactly rent a saw for a month.) I could have bought a cheap one for $70-$80. Instead, I used a simple tile cutter that cost closer to $20. It is a small tool that scores and then snaps the tile. I think it was a great choice for this project since I had no idea if I would ever be tiling again; but I don’t know that it would hold up for too many more major tiling projects. Now, that I am all high on my success and ready to tackle the world, whenever my little tile cutter gives out on me, I will probably invest in a wet saw for my next project. (I’m eyeing this one myself.) I also used these diamond hole saws to cut holes for the shower head and faucet. So what do you think? 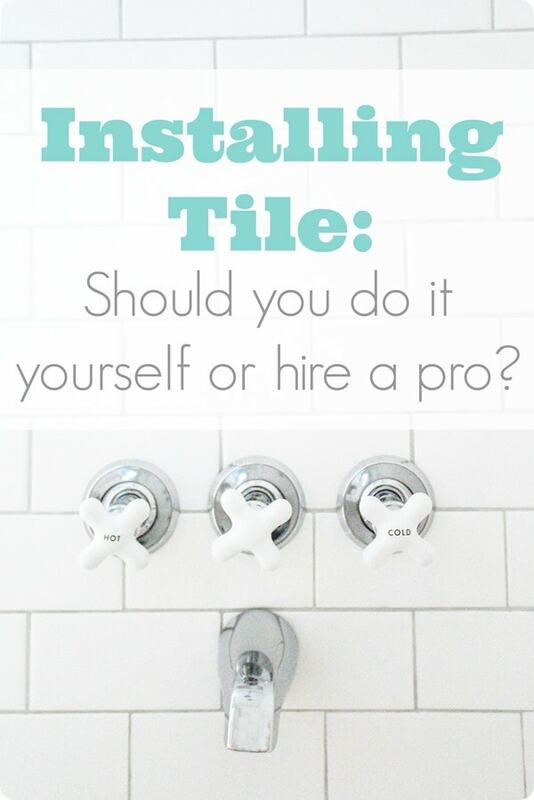 Would you be willing to tackle tile on your own? 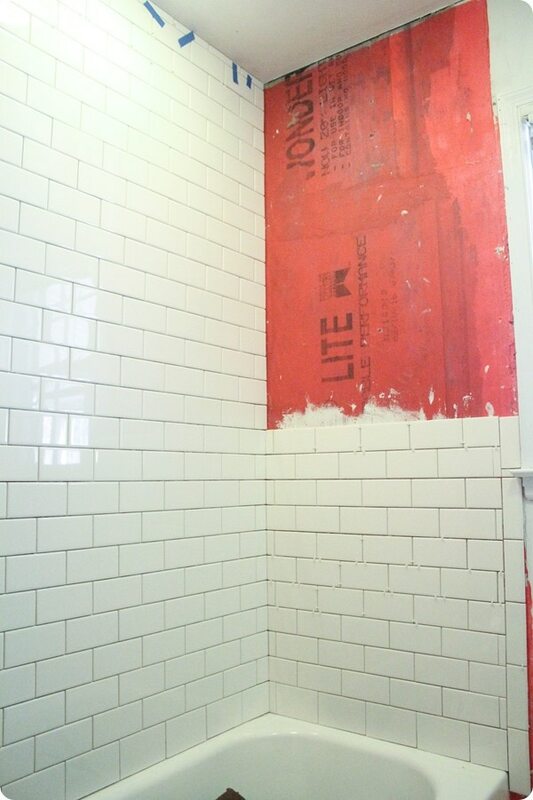 My level was my best friend as well when we tiled our bathroom……also in white subway tile! The master bath and closet was a complete gut job with EVERYTHING being relocated. I’m talking walls, windows, doors, fixtures and dropping a ceiling. We spent about $5,000 in total for materials, clawfoot tub, pedestal sink, new toilet, lighting, vent, new 4′ by 4′ window that was custom made and faucets. We made our own built in cabinetry including a medicine cabinet that has 3 mirrored doors and spans the width of the room which is 7 feet. If we hadn’t done all of the work ourselves, there’s no way we could have afforded it as with so many things in our life, lol! I am not the most patient person in the world nor is the hubs but we girded our loins, gathered up all the persnickety-ness we could find, gritted our teeth and jumped in the deep end of the pool. It took FOREVER. But it came out beautiful and we love it. It’s just what we wanted. And folks are absolutely floored that we did it all ourselves. Tiling was a bear of a job but patience and attention to detail makes all the difference in the world between a so-so job and a professional looking job. 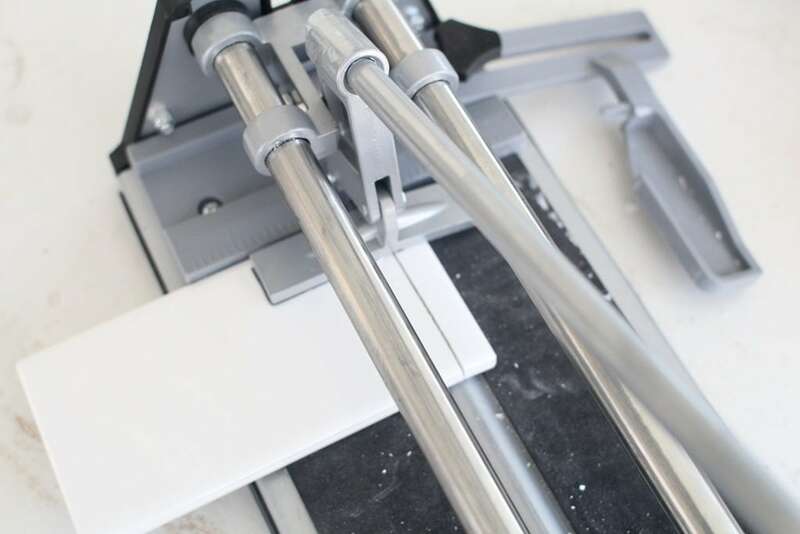 I believe that we used the same tile cutter you did! Couldn’t afford a wet saw, lol! When we remodel the kitchen, I’ll make very sure a wet saw is in the budget! Kim, your bathroom reno sounds amazing! I am so impressed that you did all of that yourselves! I’m sure you saved many thousands of dollars by tackling it yourselves. I’m hoping to be able to take on more of our next bathroom remodel on my own. Even though I did most of this one, we hired contractors to deal with our water damaged floors and replace all our plumbing wires. We need to fix the problems in our master bath in the spring and I’m hoping to do almost everything myself this time. We’ll see how it goes! 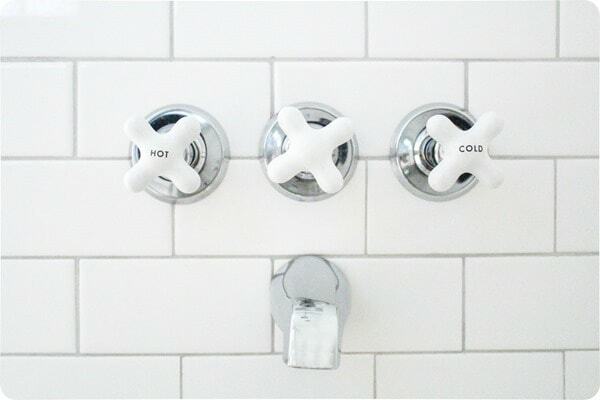 What is Tub/Shower faucet combo set? Looking for 1. thanks. Your work outstanding as always. Thank you so much! The tub/shower faucet combo set comes with the actual faucet, the white hot and cold shower handles and shower handle, and a basic showerhead. In our bathroom, I did end up using a nicer showerhead that I already owned. I absolutely love the look of the handles with this set though. I wanted to renovate my bathroom.I hired the contractors who could do the job.I saw they used the simple cutter to snap the tiles.They also diamond hole saws and it did an excellent job.Now my bathroom looks totally changed.The information mentioned in our blog is very practical and helpful. Thanks for the informative article. I get to know a new technique through your article is- cutting holes for shower head and faucet with diamond hole saws. Really its very handy and saves a lot of money. Gives me hope for a small kitchen back splash! Thank you!